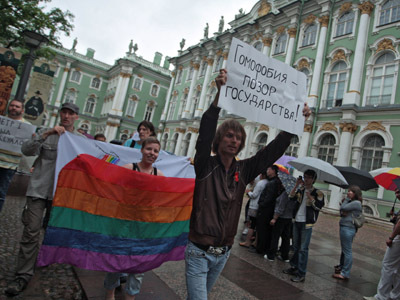 Dozens gathered in a city center park to mark International Day Against Homophobia. City authorities had sanctioned the demonstration, and a police unit shielded participants as they chanted slogans and gave out balloons to passers-by. A larger crowd of anti-gay protesters, some wielding Orthodox crosses, repeatedly shouted death threats, and attempted to break the cordon. Eventually, one man struggled past the police and sprayed mace at one of the demonstrators, who lay prone for several minutes until paramedics arrived. Afraid the police would not be able to keep the peace, the activists wrapped up the event within minutes. Police escorted the participants on to buses, but the convoy had only traveled several streets when a large group of shaven-headed men sporting football and neo-Nazi attire blocked their path. The assailants threw several smoke grenades at the buses, before rushing them. They broke the windows with rocks and clubs and climbed inside, punching and kicking the activists. Police officers intervened and the drivers managed to get away. The attackers then re-directed their anger at a nearby bus of migrant workers. Witnesses reported that gunshots, possibly from non-lethal weapons, were heard. At least two gay activists have been hospitalized with injuries, though the final toll is not clear, and authorities have released no figures. 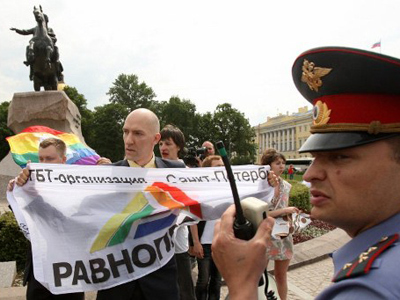 St. Petersburg recently became a flashpoint in the gay rights conflict after the local assembly passed a law prescribing fines for “homosexual propaganda aimed at minors.” Its opponents say the vague wording of the law means it can be used to criminalize any public gay events. 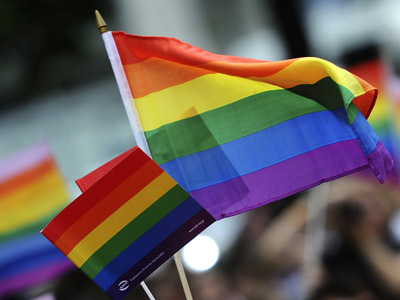 “The violence is a confirmation that the anti-gay legislation is emboldening homophobes who feel free to vent their anger at homosexuals” says a press release from LGBT group Vykhod ("Exit"), which organized the demonstration.